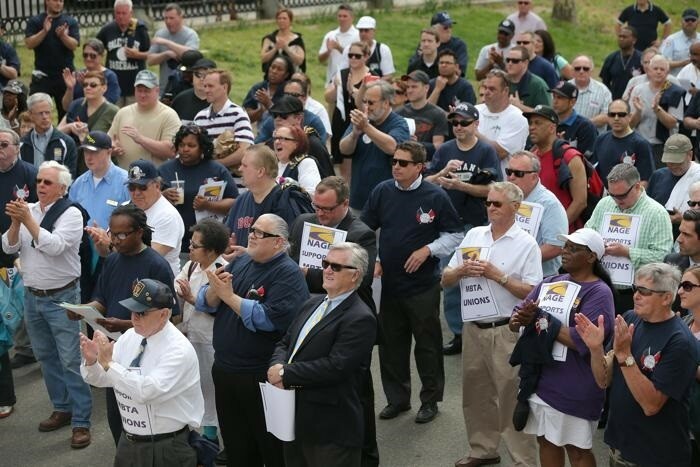 NAGE leaders and members stood shoulder to shoulder with brothers and sisters from the unions from the MBTA at a rally across from the State House on May 11, shortly before a legislative hearing on Governor Charlie Baker’s proposed transportation overhaul bill. The governor’s bill includes a provision that would suspend the “Pacheco Law,” the law requiring that any privatization proposal demonstrate a legitimate savings over providing the same service with public workers. The law was passed in 1993 after a series of privatizing scandals during the administration of Governor Bill Weld. Opponents of the Baker proposal, including NAGE and other members of the labor community, note that the problems plaguing the MBTA during the winter of 2015 were failures of management, not front-line workers, and that punishing the people who know the most about keeping the system running is merely a smokesceen for attacking workers’ rights.